Shutters provide another opportunity, along with the front door, of course, to express some individuality for your home’s exterior. Although it is customary to work within the neighborhood in terms of palette, if you feel like breaking the mold, go for it. Just be sure that your home’s personality does not overpower your own. It’s no fun to make excuses for a paint job that went haywire. In other words, if you don’t like it, paint it over! In the meantime, have another spin of the fandeck and see what paint color combinations work for you. I’m building a house and was looking to use this color combination. I haven’t seen this on any of the other houses in the community. What color would you suggest for the garage? Hi Christine! Thanks for posting. Unless you have a set of garage doors that you really want to highlight the same as the shutter color, I suggest painting them the same as the siding. That will let the accent color (shutters, front door) take center stage. 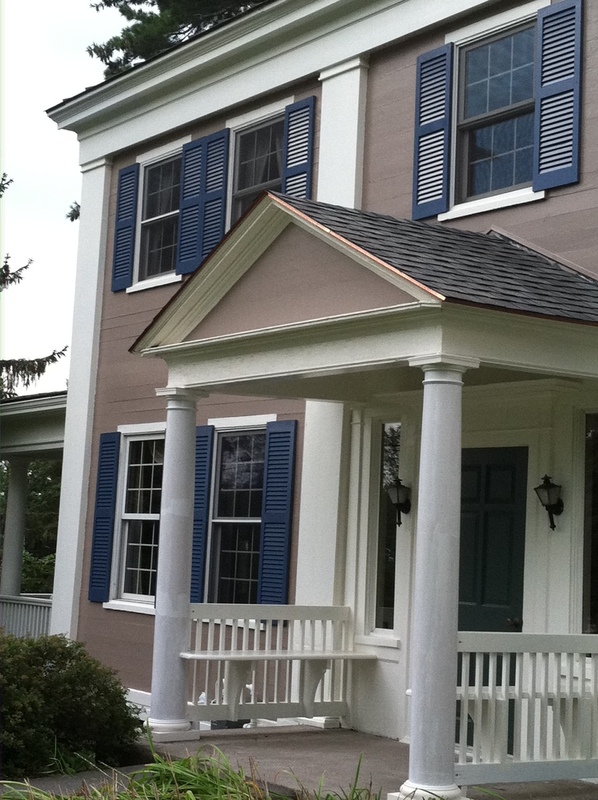 You are currently reading Shutters Shatter Traditional Color Combinations at Your Home & Color Coach.